GPS Users use: 848 Webster Highway Temple NH. Take I 95 or 495 to Rt. 3 North. Get off at Exit 8, take Rt. 101A West. At the stop light in Milford go left to pick up Rt. 101 West toward Peterborough and Keene. At the end of the Milford by-pass, turn left at the stoplight, staying on Rt. 101 West. Go just over 9 miles and look for the Touchstone Farm highway sign. At the junction of Rt. 101 and 45 turn right onto Webster Highway. Go 1 1/2 miles. Keep right at the fork. Immediately after descending a steep hill you will cross a small bridge. The first driveway on your left will have signs to Touchstone Farm, Pony Farm and Horse Power. Take I 84 East to Hartford. Take I 91 North to the Bernardston- Northfield Rt. 10 exit. In Keene, turn right on Rt. 101 East. Stay on Rt. 101 through Dublin and Peterborough and up over Temple Mountain. On the far side of Temple Mountain look for the Touchstone Farm highway sign. At the junction of Rts. 101 and 45 turn left onto Webster Highway. 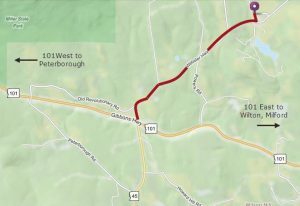 Take Route 9 East from Brattleboro and pick up Route 101 East in Keene. Turn left out of the airport driveway and continue down the hill to the lights. Turn right and go about 1 1/2 miles. Turn left onto Rt.101 West. Stay left over the bridge to take the left fork of the highway. Stay on Rt.101 West for approximately 20 minutes. At the junction of Rts. 101 and 45 turn right onto Webster Highway.